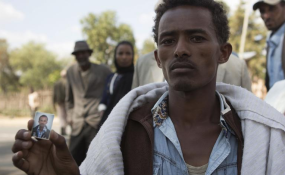 How Long Can Ethiopia's State of Emergency Last? How Long Can State of Emergency Last? Peaceful Protesters Gunned Down in Ethiopia during widespread protests in the Oromia region. The protests started in November 2015. It was late 2015 when Endalk Chala began documenting deaths in his home country of Ethiopia, scouring Facebook, Twitter, and blogs to piece together who had died and where. "There were reports that people were killed in the protests and no one was reporting about it. No one cared who these people are," Chala told the Thomson Reuters Foundation by phone. "The information was all over the internet, not well organised. I just wanted to give perspective." "I started to collect the information from the internet: Facebook, Twitter and blogs. And I started to contact the people who had put that information out," he said. However the United Nations High Commissioner for Human Rights, Zeid Ra'ad Al Hussein, criticised the government for a lack of accountability and called for access to protest sites. "Any time victims of human rights abuses share information with outside groups, with journalists - either domestic or international - there's often repercussions, quite often from local security officials," he said. Horne said Facebook was a key source of information in the early stages of the protests but this was quickly seized on by the government and security officials checked students' phones. Horne, whose organisation also attempted to document the deaths, agreed that numbers are important for accountability, but said a focus on the death toll alone can be de-humanising. "We've talked to so many people who were shot by security forces. Many of them children. Many of them students. The numbers sort of dehumanises these individuals." "If you're expressing your freedom, you'll be shot, and if you're asking for your rights, you'll be detained," he said. "It really hit me very hard," he said. "People will forget. They'll bottleneck their emotions and grievances and the government will just extend and buy some time, and there will be another bubble sometime in the future. That's a vicious circle." Reporting by Sally Hayden, Editing by Lyndsay Griffiths and Belinda Goldsmith.